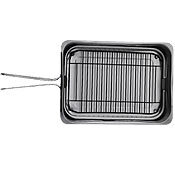 The cleverly designed Camerons Stovetop Smoker gives meat, chicken, and fish an authentic smoky barbecue flavor—in your apartment ($49.98 at Zabar’s; 212-787-2000). 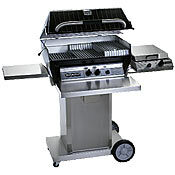 The 40,000-BTU Broilmaster Super P Series has separate systems for direct and indirect cooking, so you can smoke a pork shoulder or just char six buffalo steaks ($1,500 at Big Apple Barbeque; 718-204-1166). 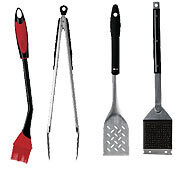 The Grill Friends silicone basting brush is long (fourteen inches) and ergonomically angled. Best of all, the bristles don’t stick to your chicken ($9.95 at A Cook’s Companion; 718-852-6901). Oxo’s locking tongs are strong and precise (for turning a porterhouse or baby asparagus) and sixteen inches long (for preventing burns) ($11.98 at Zabar’s; 212-787-2000). Oxo’s stainless-steel turner doesn’t just flip burgers; the serrated edge cuts meat to test doneness ($10.95 at Broadway Panhandler; 212-966-3434). Clean grates keep food from sticking and prevent flare-ups. Grilling guru Steven Raichlen’s long-handled, oversize brass-bristle model gets the job done fast ($16.95 at Broadway Panhandler; 212-966-3434). 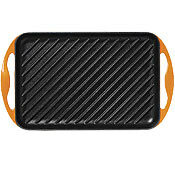 If you must grill inside, Le Creuset’s 13-by-8.5-inch cast-iron grill is big enough to handle long kebabs or four steaks at a time, and the ridges create pretty grill marks ($69.99 at Bloomingdale’s; 212-705-2238). 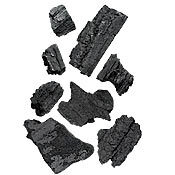 Peoples Woods’ natural lump charcoal lights in half the time of briquettes and reaches a higher temperature, which helps seal in juices and impart flavor ($10.95; 800-729-5800). Another $30 worthof tilapia just plopped onto the coals? 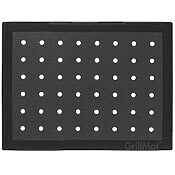 Try Grill Friends’ large (about sixteen by twelve inches) nonstick silicone grilling mat ($19.99 at Broadway Panhandler; 212-966-3434). 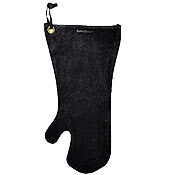 Lamson Sharpton’s elbow-length heavy-duty suede oven mitts are strong enough to protect you from high heat, but supple enough to handle tongs and the like ($26.99 each at Gracious Home; 212 517-6300). 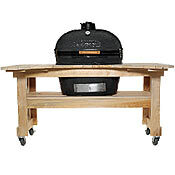 Styled after the Japanese kamado, the ceramic Primo grill and smoker seals in heat, so the steaks you present on the cypress table will be extra juicy ($800, with table $1,300, at the Fireplace Patio Shoppe; 914-337-5301). 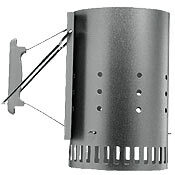 The Weber chimney starter’s cylindrical shape promotes a fast burn. Fill it, light it, and you’ll have reliably hot coals in ten minutes, with no lighter fluid—or swearing ($16.99 at Gracious Home; 212-517-6300). Your summer guide to the world’s oldest culinary technique, featuring all-star chefs and styles from across the globe. An obsessive amateur cooks a meal for grill virtuoso Bobby Flay.